You know what they say "what goes around...comes around!" In Karma players are trying to be the first to get rid of all their cards while trying to stop their opponents from doing the same. Tensions can run high during this fast paced card game. To set up Karma shuffle the deck of cards and deal three cards face down in front of each player. Players are then dealt six cards each which they must choose three of to play face up on top of their face down cards. This leaves each player with a hand of three cards. The remaining deck is placed face down in the center of play and becomes the draw pile. Play is now ready to begin with the player to the left of the dealer going first. On a players turn she will play a card or cards from her hand to the discard pile. In order to do so the card played must be a higher number than the previously played card or a Karma card. If the player can not play a card she must pick up the entire discard pile. Once a player's turn is finished she draws back up to three cards—unless she already has three or more cards in her hand. Play continues around the table in clockwise order with players playing a card from their hand and drawing back up to three until the draw pile runs out. At this point players then can play the cards on the table in front of them starting with the face up cards first. Once the face up cards have been played players must play their face down cards not knowing what they are. Scary! The game ends when one player has played all her cards. Karma cards include actions like forcing another player to take the entire discard pile, playing a card lower than a five, taking the bottom card of the discard pile and placing it on top, or playing cards from the table in front of you. 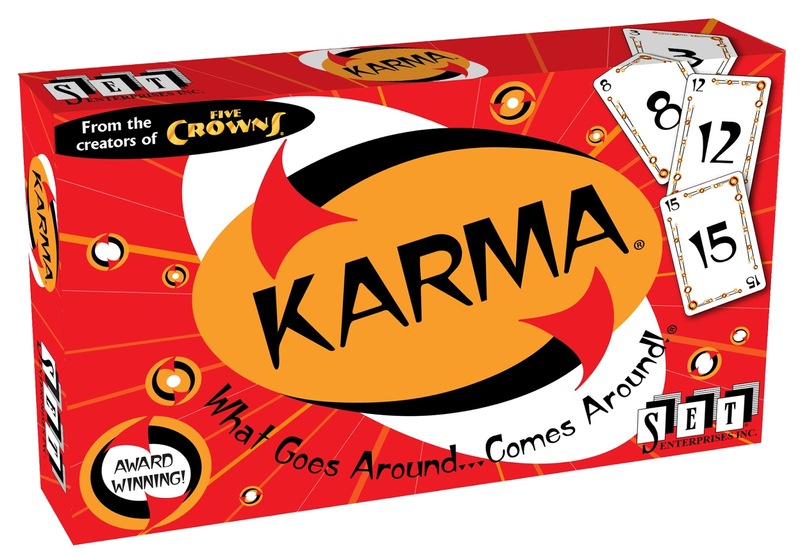 As with most Set Enterprises games, Karma does not have a theme per se. It is an abstract game similar to UNO or Phase 10 although it plays quite a bit different than these. Karma is a card drawing hand management game with a twist at the end that comes in the form of playing your face down cards blind. The mechanics are polished and allow for smooth and quick play. The artwork is minimal, however the graphics and layout are attractive and clear to understand. The card quality is good making the cards easy to shuffle and handle. This is a good filler game that can be played quickly by both gamers and non-gamers. The rules are easy to understand and the game is easy to teach. There is a lot of "take that" in this game and if you have read any of my previous reviews you know that these are not my favorite style of game. That being said if you know what you are getting into before you play it can be quite enjoyable. As mentioned above this is a quick and easy game to play, one that can fill in down time during a gaming night. It is also small enough to pack in a purse or back pack to take with you and play as you are waiting at a restaurant for your food or needing a lunch time break. 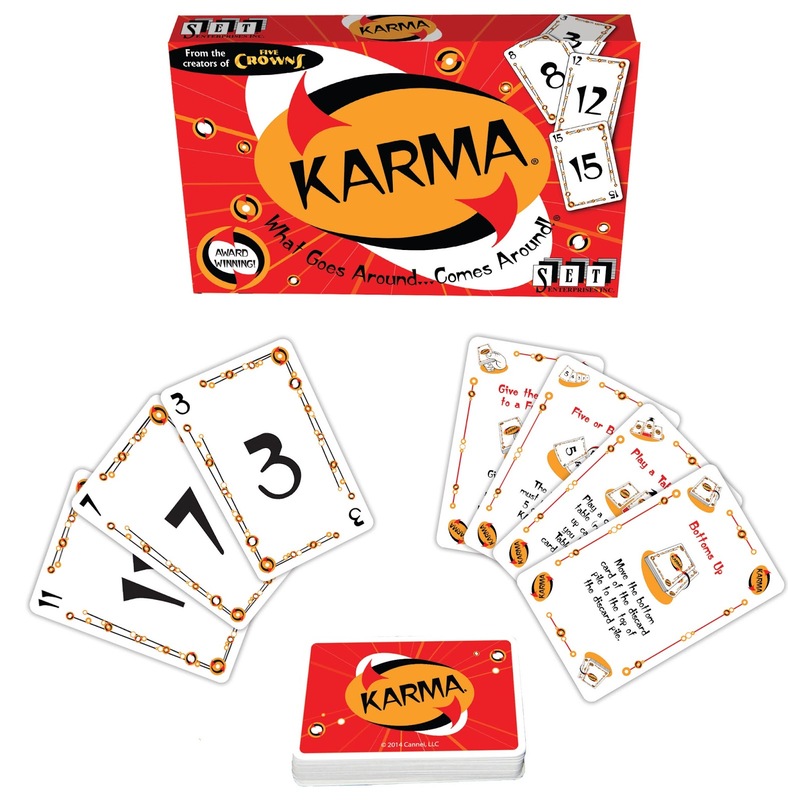 Players who like UNO, Phase 10, and Skipbo will love Karma! I am giving Karma 3 out of 5 super meeples.